Angular is incredibly powerful and can sometimes be overwhelming, but Lukas has realized a few common themes he keeps revisiting over and over. In this course, Lukas shares with you the patterns he has found most effective as you build out an application piece by piece. Learn everything from naming conventions to organizing your app into services, directives and routing with examples and challenges to anchor the concepts. By the end of the course, you will be able to see how these patterns could be applied to approximate some of the most popular web applications that we use today. Lukas talks at a high level about how he builds Angular applications. He diagrams the basic anatomy and explains how various components like views, controllers, directives, and services are related. 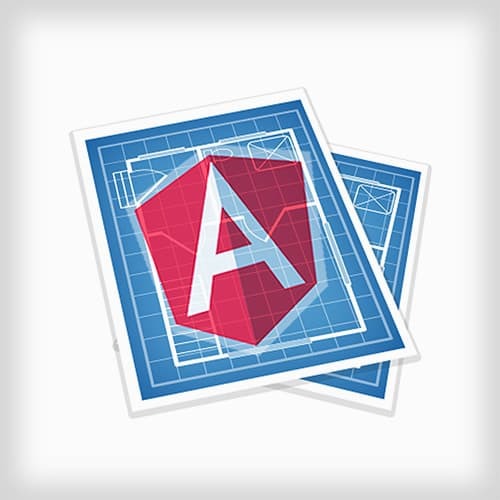 Structuring files based on feature rather than type will make Angular applications more organized and easier to manage. Lukas shows how he structured the Noterious application to emphasize this style of organization. He also talks about how to organize common resources. Angular modules are logical containers to organize code. They promote re-usability as well as an a-la-carte development experience. Routes allow you to directly navigate to a specific state within the application. Lukas spends a few minutes explaining the the Noterious application. He walks through how the application is instantiated and where the routes are declared. Because state is separate from the DOM, Angular is an extremely easy framework to test. Unit testing can be done with Karma. E2E testing can be done with Protractor. Lukas introduces the first challenge. In this challenge, you will create the file structure for the boards feature. Then you’ll create a boards route and write a unit test for that route. A view represents the DOM after it has been compiled by Angular. The view is primarily responsible for displaying the model state and and conveying user interaction. Controllers are responsible for constructing and maintaining the model for a view to interact with. Ideally they consume data from a service and delegate the manipulation of that data. The “Controller As” syntax was introduced to provide a more explicit syntax for declaring methods and properties. Lukas explains this syntax and talks briefly about properties and methods within a controller. In this challenge, you will use ng-repeat to display all the boards in the collection. You will also add functionality for creating and editing boards. Lukas walks through the solution to challenge 2. Lukas spends a few minutes explaining how he tests services using mock objects. He then answers a few audience questions about using a factory vs. a service. Lukas spends a few minutes walking through his use of the $http service object in the Noterious application. This shows how easy it is to build a CRUD-style service API with the existing methods. In this challenge, you will create a BoardsModel service that will retrieve a remote board using the $http service object. You will also write a unit test for the BoardsModel service. Lukas demonstrates the solution to challenge 3. Directives allow developers to encapsulate custom functionality using HTML tags and attributes. The three main elements of a directive are the link method, controller method, and the directive definition object. This challenge requires you to create a board directive and move the board list HTML into a new template. You’ll also bootstrap the board directive with link and controller functions. Lukas walks through the solution to challenge 4. Lukas takes a few minutes to explain the concept of isolated scope with directives. This technique allows you to call a function specified in the HTML from your directive. After talking about isolated scope, Lukas answers a few audience questions about local data storage and controller usage. While ngRoute is useful, ui-router has many more capabilities. With ui-router, you can create named views and have them nested. This allows you to turn your application into a ore precise state machine. In this challenge, you will create a new route to show the details of the selected board. You will use $state.go() and ui-sref to navigate between the states. Lukas walks through the solution to Challenge 5. After looking talking about a couple ways the Noterious application could be modified or extended, Lukas gives out an assignment with a few additional challenges. These include extending the model to include extra properties, adding animation, creating alternate layouts, or integrating 3rd party components. Lukas wraps up the course by answers a number of audience questions and giving out a few resources.